I was also lucky enough to stay with David Shaw and his family after Readercon: David is the author of the wonderful BelmBlog, about his adventures in the wilder shores of cooking. In return for my supplying him with bad-pun titles for his blogposts, I was able to sample some of his marvellous cuisine – particularly the eight-different-versions-of-chocolate combo linked in the last post. If you’re at all interested in cooking, I strongly recommend his blog – even if you’re not at the liquid-nitrogen-in-the-kitchen stage of things. The SF Encyclopedia continues to add content, at the moment especially in the Gallery, which now comprises nearly 5500 cover images for sf & fantasy books. 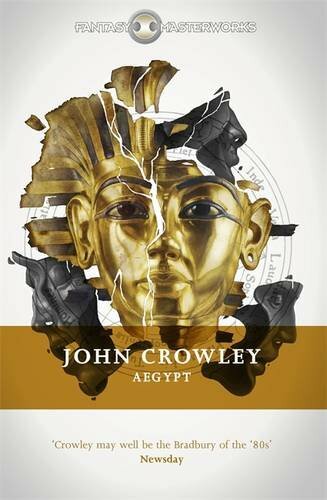 Finally, since the news is now on Amazon, I suppose I can mention that Gollancz is reviving its Fantasy Masterworks series from October, with launch titles such as John Crowley’s Ægypt. I’m putting the cover up here partly because it’s very striking, partly because the book is one of my favorites, and partly because I was delighted to be able to write an introduction for it. Very much looking forward to holding the book in my hands. ~ by grahamsleight on July 22, 2013.